How do Coassemble LMS account permissions work? Note: Depending on your Member role, and/or assigned permissions, you may not be able to see any or all parts of some or all of the screens below. For example, if you don’t have the permission to ‘Invite’ Members, you won’t be able to see this option on a number of screens. Regardless, the information below should help expound what you can and can’t do with your current permissions. 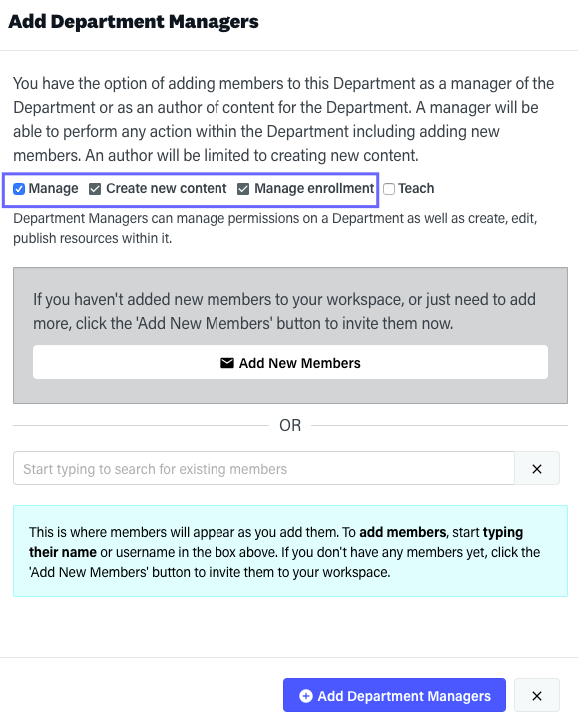 From the same screen you can also assign Manage, Create, Enrol, and Teach permissions across the entire Department (more about that below). To start managing your Team, go to the 'Manage' tab and then 'Team'. 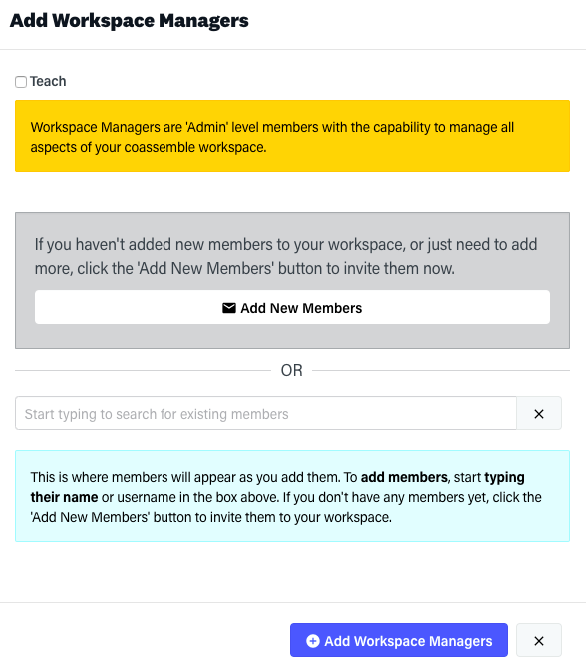 Existing Members who are checked in this list will be granted “Workspace Manager” permissions after selecting the ‘Add Workspace Managers’ button. Members who are invited via the ‘Add more Members’ function will be become Workspace Managers after creating their accounts. To cancel the action, select the “X” button. 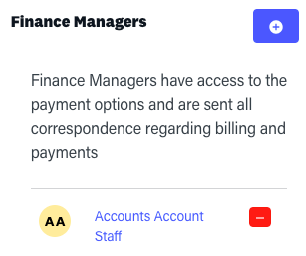 Finance Managers have access to payment options, and are sent all correspondence regarding billing and payments. 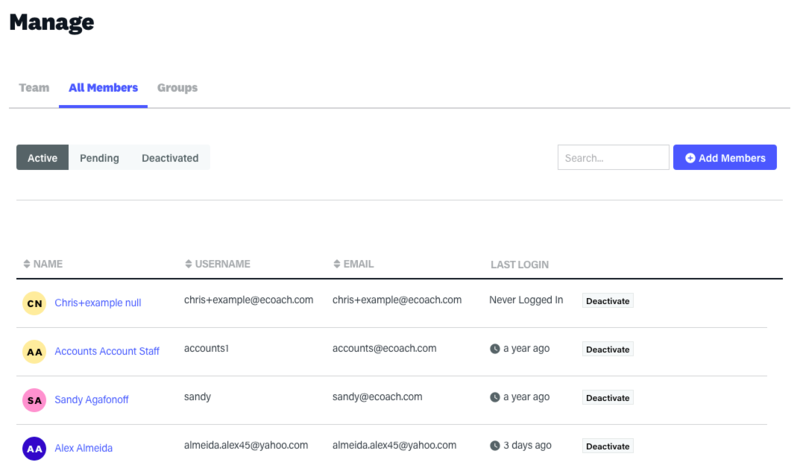 This useful for larger organisations where the accounts team don’t need to be involved in the platform, and/or where the Workspace Managers don’t need to be involved with billing and payments. To add a new Finance Manager, select the ‘Add Finance Managers’ button, and then follow the same steps as above. Adding a Member as Department Manager grants them administrative permissions to all entities under this Department, including authoring of all content within the Department. 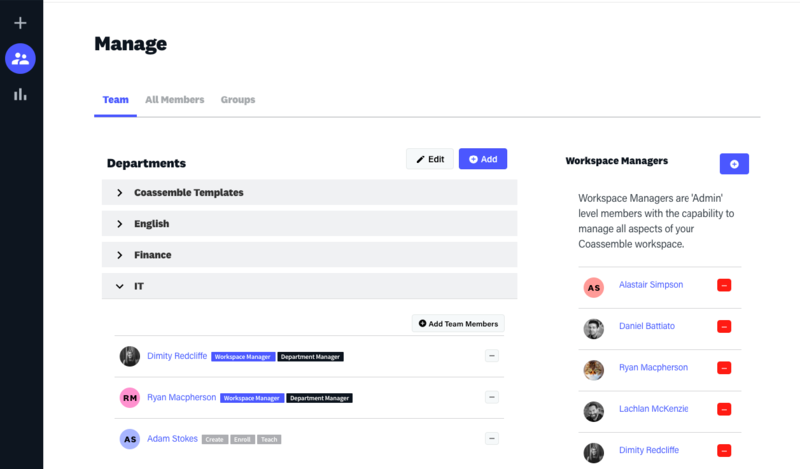 You can then select from existing Members, or invite new Members to your Workspace by using the ‘Add more Members’ button (top right, above). 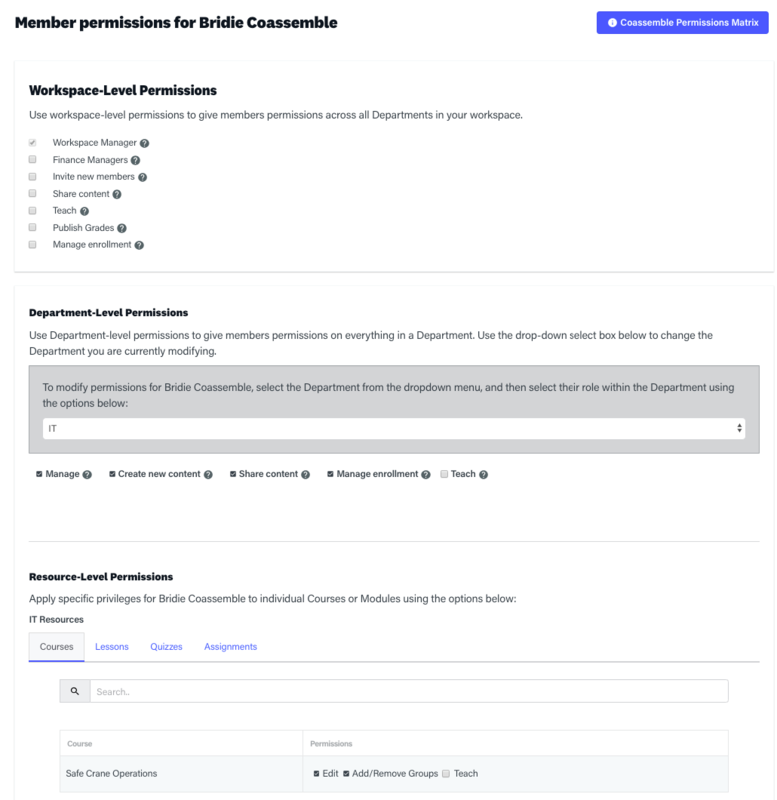 Existing Members who are checked in this list will be granted “Department Manager” permissions after selecting the ‘Add Department Managers’ button. Members who are invited via the ‘Add more Members’ function will be become Departments Managers after creating their accounts. To cancel the action, select the “X” button. Create: This allows the Member to create new Courses, Lessons and Quizzes, within the Department, however, author rights are not granted on any other Courses under the Department, unless explicitly given (i.e. they can make new Courses, but can’t make changes to anyone else’s material unless someone has asked them to). Enrol: Allows the Member to enrol new Members and facilitators to access this content and remove them. Teach: Allows the Member to ‘teach’ content within the Department (i.e. a ‘Facilitator’). Enrolled members’ (aka Participant) answers will be visible and can be graded, and Facilitators may also preview the content themselves. As described at the top of this FAQ, Team members can also be invited to collaborate on a specific module, with access restricted to authoring on only this module (as one example), but there are several other options available. 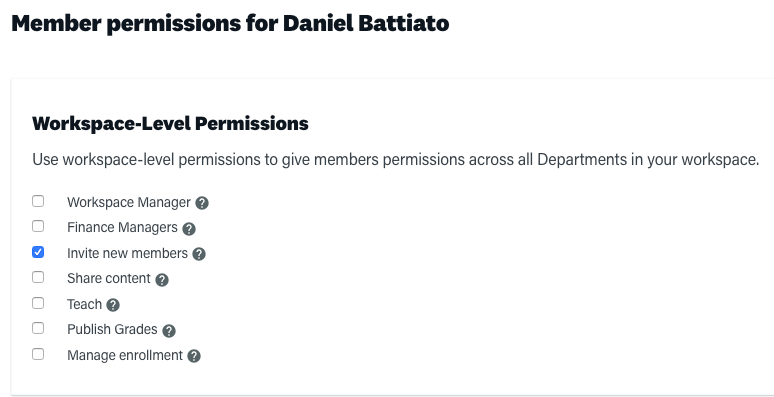 Once a Member has been added to a Department (with any permission) you can select them and then apply any number of Course Permissions…. Edit: Allows the selected Member to modify the course description and settings and to add and remove modules from the course. Note – this does not allow the member to modify, publish the modules themselves - for that you will need to add a permission on the resources you want to give access to. Teach: Allow this member to teach this content. Enrolled members’ answers will be visible and can be graded, and teachers may also preview the content themselves. Module permissions can also be assigned a singular ‘Edit’ permission from within the Department’s Courses, Lessons, Quizzes or Assignments tabs. Granting this permission allows this member to change this resource, including modifying all the resource’s content and publishing or reverting changes. Proceed with caution: granting this permission allows the selected Member to Invite new people to your Workspace, which will will affect the total number of Active Members in your Workspace. For information about Active Members please check out the Active Members article. 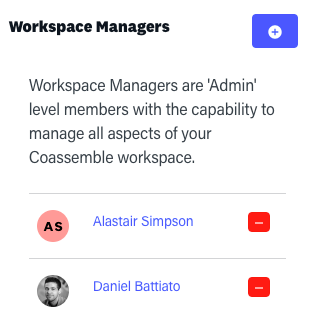 As you can see Coassemble LMS has a flexible but powerful permissions structure that allows you to configure an array of possible roles within your Workspace or Organisation. If you need help getting setup, please give the support team a shout.